If your claim is not on file with the payer, it is likely it was rejected at the clearinghouse. Please check on your claim status with the clearinghouse. Below are a list of common rejections you might see. In order to submit secondary claims you will need to explain how primary processed the claim. In TheraNest we do this with adjustments. Payments + Adjustments must = the total amount billed of the invoice. This rejection indicates that a taxonomy code is missing on the claim. If the taxonomy code is required in box 33b you will enter a taxonomy for the Billing Provider on the claim. If the taxonomy is required in box 24 you will enter in a taxonomy for the Rendering Provider. Usually this rejection indicates that the gender is missing from the Insured's information. 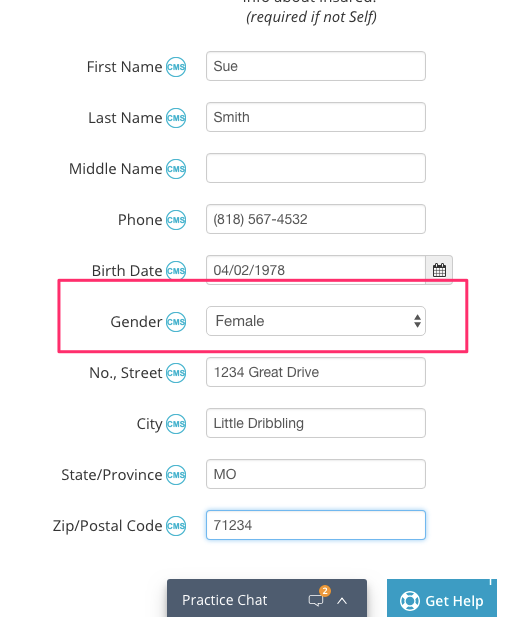 You can fix this by going to Client > Details > Bill to and Insurance > Scroll Down under Primary Insurance and make sure the gender of the insured is not "undefined"
Element SBR05 is missing. It is required when SBR01 is not 'P' and payer is Medicare. Segment SBR is defined in the guideline at position 2900. This rejection indicates that an Insurance Type aside from "Other" needs to be used for this payer. Go to Billing > Insurers > Edit. Under Insurance Type, you will need to change from "Other" to another designation. This indicates you need to complete EDI enrollment paperwork before your claims can be forwarded to the payer. You can get this information from your clearinghouse. This rejection is usually indicates the Rendering Provider is missing from the electronic file. Note: The information in the electronic file is controlled by your EDI File Settings. The information on the PDF version of the CMS-1500 might be different than the electronic claim according to these settings. You can edit your EDI File Settings by going to Billing > Insurers > Edit. Click here to see more information on EDI File Settings. We are always happy to help you troubleshoot your claim issues. If this article did not help, please complete the Claim Research Form below and we will be happy to research this for you.